"So, I was driving down this country road, right next to the runway. All the cow parsley was in flower, the swallows were skimming through the trees, there was a clear sky, the light was beautiful, kind of violet - and suddenly I heard this roar." Join Burning Coal for the US premiere of British playwright Clare Bayley’s funny and troubling play about a photographer who inadvertently snaps a picture of something he shouldn’t have. 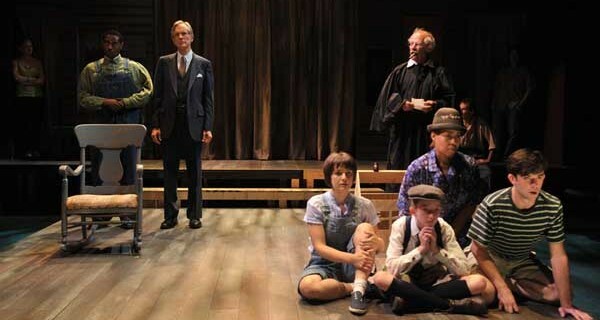 The play is based on a true story and deals with one of the darkest episodes in recent US history … and it happened right here in our own backyard. 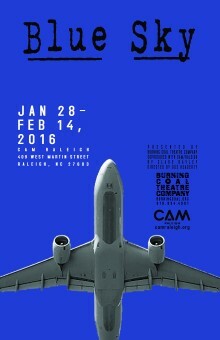 NOTE: Blue Sky will be presented at CAM/Raleigh – 409 W. Martin Street, Raleigh. NOTE: The performance on Friday, February 5th will begin at 10 pm following the First Friday festivities at CAM, which will include work related to the play. Join us early and stay late for the show! NOTE: Performance on January 31st at 2pm is the ‘Pay What You Can’ performance and will also be Audio Described for the sight impaired. Prior to the performance, we will have a 1 pm “Tactile Touch Tour” of the BLUE SKY set led by the Contemporary Art Museum. This event is a collaboration with ArtsAccess of Raleigh. NOTE: On January 26th and January 27th, 2016, we host Open Rehearsals from 6 to 7 pm. These events will be free to the public. No reservations necessary but please plan to get to CAM on time and stay for the full hour.